The London Canals are truly one of city’s best (not-so-hidden) secrets. They’re the antidote to central London’s chaotic energy. Instead of the typical bustle, the canals are quiet, laid-back, and artsy. They’re full of charming surprises too! Here’s the best way to approach them. Though interesting no matter the weather, in spring, the canals come into their own kind of bloom. Expect cafes (both in buildings and on boats), booksellers, and street artists. That said, the nicer the weather the bigger the crowds—don’t expect to move much on a summer’s day. The whole canal system measures close to 220 km—you’ve got a lot of options. Our walk is considerably more modest at 9 km, roughly 2 hours of walking. The walk goes between Victoria and Regent’s park, taking you through most of central London’s Canals in the process. Where you’ll escape the tourist-fuelled insanity of the central market for a more relaxed vibe. 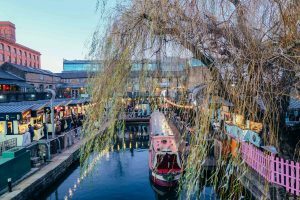 If you’re hungry, the street food at the Camden Lock is some of the city’s most creative and mouth-watering. Tandoori Chicken burger anyone? Walk east along the river past a fascinating mix of architectural styles. Though among the more quiet stretches of the walk, you’ll have plenty to look at. Keep an eye out for the new apartments built out of the industrial-era gas holders. The sudden rush of busyness means you’re reaching King’s Cross. The 2018-finished Lewis Cubit Square and Granary Square has revitalised the area. Explore the boutique shops and restaurants based in warehouses, and don’t miss the musical fountain. As the home to Central St Martin’s, London’s premier fashion school, expect to rub shoulders with some rather well dressed people around here. Which will force you to trek above ground a half-kilometre before rejoining the canals. Luckily, the diversion will take you through Angel, a lovely neighbourhood in its own right. For the most direct route, walk along Chapel Market, cross Upper Street, and head straight along Duncan Street until you see the canals. From here, it’s a straight shot to Victoria Park. The longest section of our walk is also among the prettiest and liveliest. Where new architecture collides with old industrial warehouses, and you’re never far from a café or espresso-boat (yes, that’s a thing). Be on the lookout for: the towers in the City Road basin, the street art around Haggerston, and the little canal gatehouse (now a small flat) near Broadway. 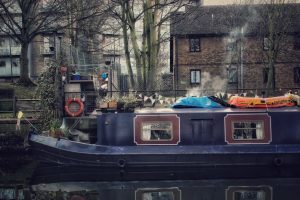 At the (unforgettably named) Cat and Mutton bridge, you’ll have the chance to leave the canals for Broadway Market. On Saturday the street fills with clothes stalls, but it’s got a number of great restaurants and cafes to interest you any day of the week. Continue past it for London Fields, the city at its most bohemian, and Netil 360, East London’s signature rooftop bar. Easily one of the nicest parks in a city famous for its green spaces, Victoria Park is the perfect end to your long stroll. Lie back on the grass, or maybe have a pint at one of the many pubs on the park. Either way, you deserve it. And beyond? 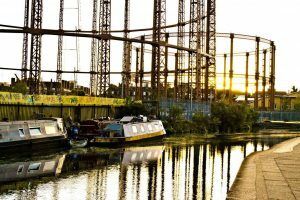 Well there are 2000 miles of them to walk along if you’re still not satisfied—continue east on the London Canals for Hackney Wick, or west for Regent’s Park and Little Venice. To escape the city, though, check out our day trips to York and Bath as well!